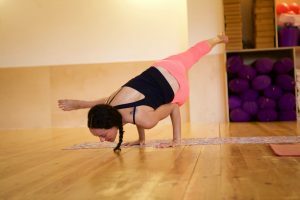 Do you feel as though your yoga practice has got to a stage where you would now like to explore arm balances in more depth? Or perhaps you are an experienced yogi who hasn’t had the time to dedicate to serious arm balance development? Even our most regular Kuli’s might need an extra helping hand when it comes to exploring arm balances, because no matter how great a yoga class is, there often isn’t enough time to explore a balancing posture in detail at the end of a 60-minute class. This is why we encourage students to take part in workshops which give them a detailed, in-depth insight into one element of their practice that they might be keen to explore. 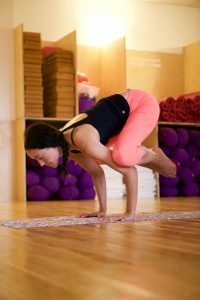 Heather Gregg’s Introduction to Arm Balance workshop has been specifically designed to teach you the foundations and preparatory steps of arm balances, so you can understand the essential actions and movements, allowing you to approach arm balances safely with greater confidence, mindfulness and ease. It is hugely important that your yoga practice is safe at all times, therefore learning how to go into an arm balance safely from the beginning of your yoga practice will mean a longer-lasting yogi lifespan. It is incredibly important we listen and look after our bodies. A compact arm balance, Bakasana tones and strengthens the abs and arms. rm far around the outside of the opposite thigh. Eka Pada Koundinyasana has a lot going on—the twist, the legs going their separate ways, oh, and the arm balance. As we all know there are an enormous number of benefits when it comes to yoga, but more specifically there are lots of benefits when it comes to arm balancing. During our yoga practice we build up strength in the upper body, which is great because this strength helps us as we move through life into old age. Have you ever seen some elderly people struggle with heavy doors or heavy bags? Years of not building strength means that the upper body muscles diminish over time. Arm balances are a great addition to our regular yoga practice and really focus on building strength in the upper body, arms and torso. They’re really fun too, once you get the hang of them. This workshop is not suitable for complete beginners, however, you don’t have to be the strongest or most flexible to begin your journey into arm balancing. Some people are quite strong but might not be able to go into arm balances because they don’t have the required flexibility and vice versa. All, but complete beginners and welcome to join in on this great workshop. Heather teaches classes in a variety of styles for all levels in UK (West Yorkshire & London) & India (South Goa). She is a fully Registered Yoga Teacher with Yoga Alliance. Classes are accessible, authentic, mindful and playful with a focus on correct breathing and body alignment. They incorporate different themes and sequences to build stamina, strength and flexibility, detoxifying the body, relaxing the mind and releasing blockages in energy flow of the body. If you are interested in exploring arm balancing with an incredible teacher Heather Gregg come to our workshop on Friday 30th September 7:15pm-9:15pm. Find the physical and mental strength to fly gracefully and fearlessly into arm balancing. Book your place today to avoid disappointment.